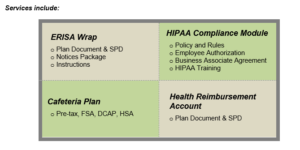 Our past two blog posts were about the requirement to report and disclose information on employee benefits plans. If you are feeling a bit overwhelmed by this, especially if you didn’t know about these requirements before, we have a solution to help! OA’s Platinum Partner status with EZ ERISAPlan makes it easier than ever for you to meet your obligations and comply with the rigors of ERISA and HIPAA and related laws, all with the industry leading warranties. We can provide you with the solutions in an EZ and cost affordable way. If you need all of these, there is an All-in-One Subscription that provides all of these to you at a bundled price! $1,000,000 of Penalty Protection! If you are penalized on a document that is produced on the EZ ERISAPlan site, the Warranty covers those penalties to $1,000,000. Legal Services Warranty! If you are audited by the government on an EZ ERISAPlan document, EZ ERISAPlan will send you a lawyer for free! This is a simple and complete solution to solve your compliance requirements…contact us today to learn more and ensure your plans are covered!